What do you do when an old tree inevitably dies? Yes – the big one. Can you imagine what I felt when the tree you can see again here, immediately to the right of the red Acer, was on the way out? My first reaction when my lovely Photinia ‘Redstart’ had a few dead branches was to try to save it – sadly, to no avail. Eventually it had to go. OH had a real job first taking the tree down branch by branch, then the main trunk – and then attempting to dig out the roots, which were massive and stretched out in every direction. I am sorry I didn’t take a ‘during’ or ‘after’ photo, but I’m sure you can imagine a large patch of rough earth with a big hole in it, lots and lots of ivy and some brambles as well. A bit of a horror story! What next? No point grieving over an old tree – use the opportunity and get planning, of course. 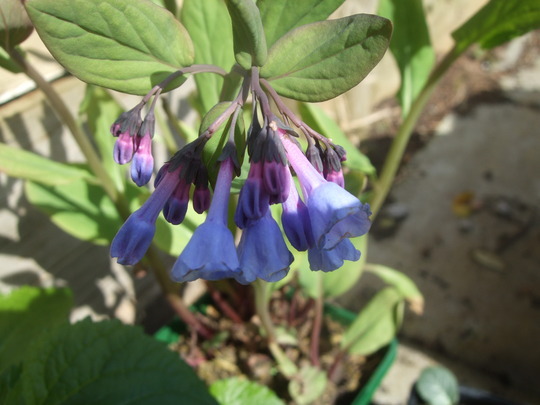 Look at my ‘wish list’ – and start tracking down plants and trees. It was going to be a huge project. I think I spent two solid weeks digging, getting rid of ivy and inevitably hitting roots. Poor OH was kept busy with his loppers, after plaintive cries of ’Here’s another one!’ – sometimes they were too big for loppers and he had to lever them up with a pick axe and use his chain saw on them. Of course, a tree that had been ‘in situ’ for years had drained the soil of nutrients, so I must have dug in at least ten barrow loads of compost. I collected several buckets of huge stones. 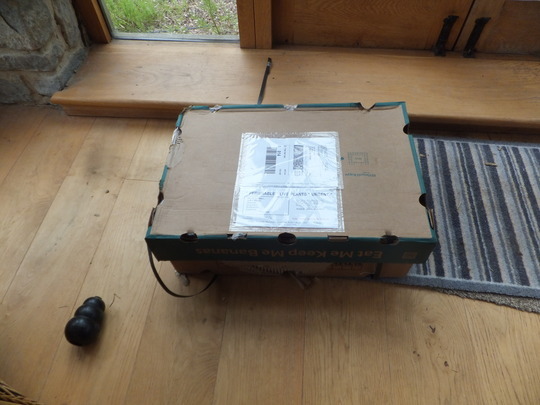 Then the fun part – ordering and receiving lovely parcels of plants, and visiting the Garden Centre with my list. 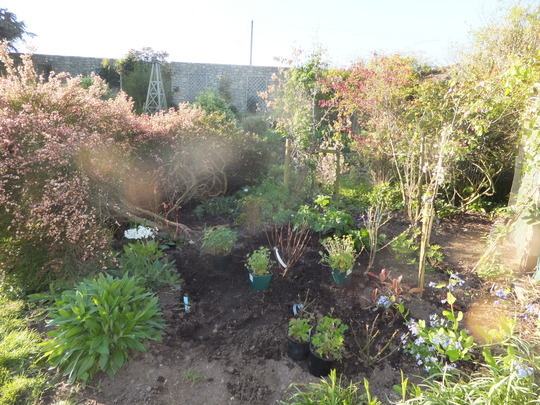 The trees came in huge containers which I could hardly lift – I dug the holes and OH helped me plant them. 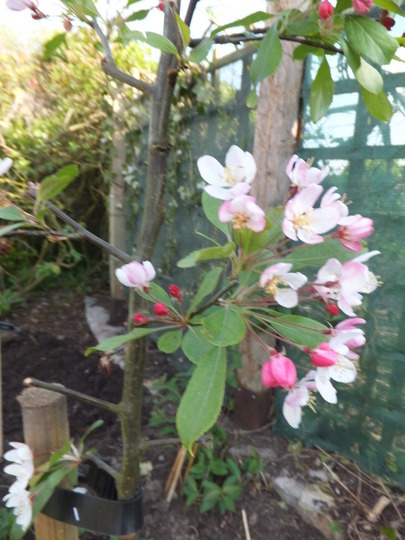 I chose a Malus floribunda and a Cornus Kousa ‘China Girl’, plus an unusual tree I’d seen in an Open Garden called Buddleja colvelei. They had to go in first, so I had placed upturned flower pots to mark where they were to be planted. 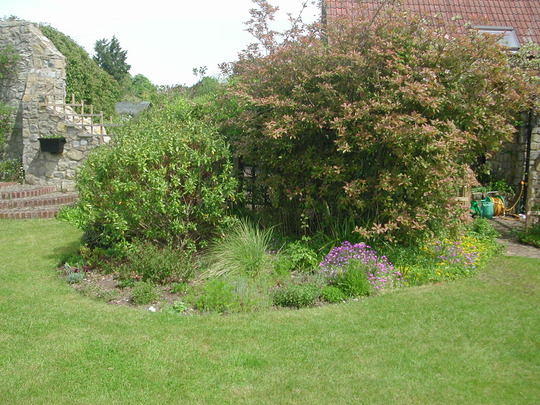 Then, as I collected smaller perennial plants, I put them into position before I planted them. In the front are three roses – ’You’re Beautiful’ with Geum ‘Bell Bank’ and Geranium ’Johnson’s Blue’. What else is in the bed? 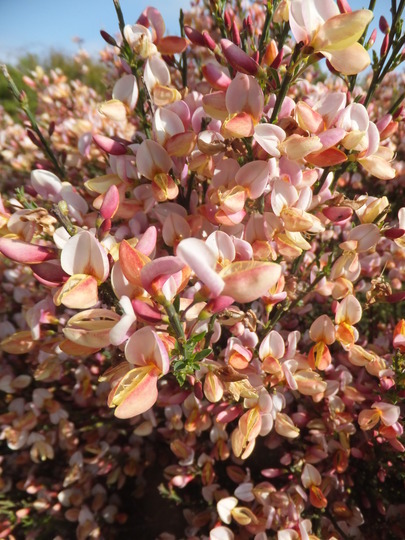 At the side is a beautiful Cytisus ‘Zeelandia’ which is getting elderly, but I love it. I tried to save some of the Centaurea montana, which may or may not survive the move. 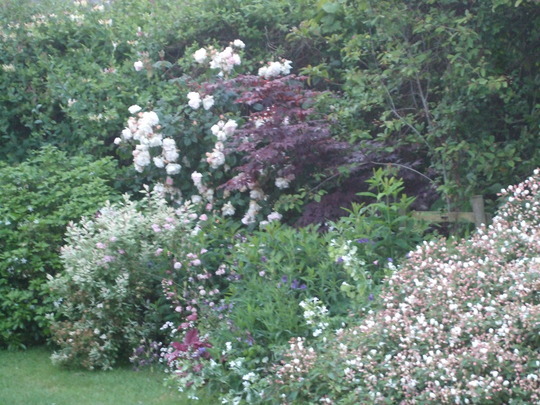 At the other side is an Amelanchier tree and the red Acer, alongside an anonymous rose I inherited. I took out most of a very old and non-flowering Honeysuckle from the fence and planted a new one – Lonicera x tellmanniana. In the middle of the bed is a Lavatera ‘Baby Barnsley’ with three Campanula ‘Iridescent Bells’, and a Buddleja alternifolia ‘Unique’. 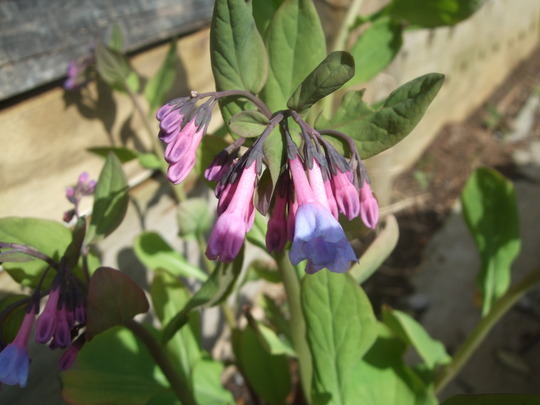 I was lucky on one trip to the GC – they had one Mertensia virginica. 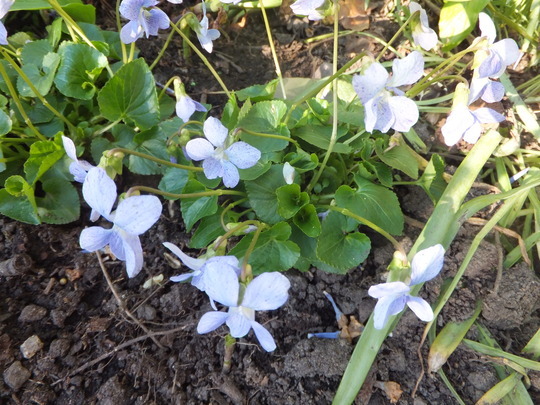 I surrounded it with Viola ‘Freckles’. 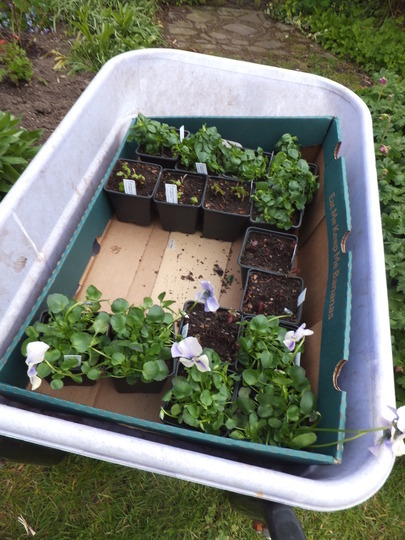 There are Aquilegia, Anemone blanda which I saved, and I have a barrow load of little plants to go in once I’ve planted a Clematis Montana on that ugly fence. The messy leaves on the right are snowdrops – lovely in early spring. 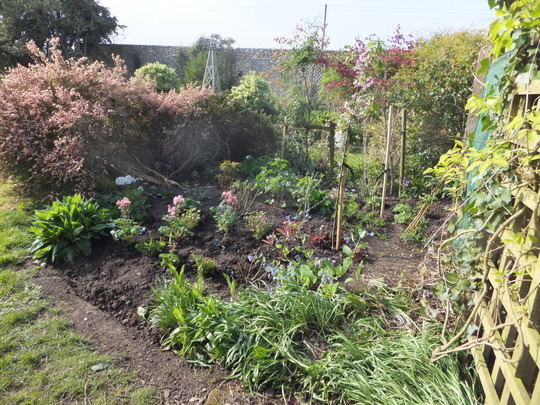 So here I am – quite pleased that the new area is taking shape and looking more like a flower bed every day. Oh, and I have re-seeded the bare edge! Maybe it was a blessing in disguise to lose that tree? Previous post: Everyone should have a Dennis! Next post: A HORROR STORY!! I'm exhausted just reading about how you tackled this project but thrilled to see the 'improvement' it has created. Well done Spitz and OH. Well that old tree has a lovely memorial garden! It all looks really good. What an enormous hole. You deserve to put your feet up now, and watch all those lovely new plants grow. this has been a labour of 'love' :o) or should that be an herculean task. Its sad when you lose an old tree but I think that having to make a new area can rejuvenate you and the garden. It looks like you`ve done a brilliant job, and as Sbg says please add more pictures as it all matures. Yes, I will. There have been more developments since I wrote the blog!!! You've worked so hard removing it, but I must say your garden looks lovely! What's the grey stone structure to the left in your first picture? It looks really nice ? That is the right hand end of 'the Great Wall of Somerset', Maggie. We had it built when the row of Leylandii we inherited started to die, and it is the best thing we ever did!!! I think I wrote a blog about it, in fact I'm sure I did. I shall look it up and have a read about it spritzhenry ?